“Thanks to Supreme Court Order 16-476, over $4 billion could move into three very specific stocks—on one day, Feb. 4, 2019. The ad is from E.B. Tucker for Casey’s Strategic Investor (currently $49/year, renews at $129), and it’s all about sports gambling — which is now a state issue again, after the Supreme Court responded to New Jersey’s long-running lawsuit and finally overturned the old prohibition that grandfathered in only Nevada as a legal sports gambling state. We’ve seen teaser pitches about gambling before, and the pending legalization in a bunch of states that immediately jumped to pass legislation allowing sports books was widely covered in the investment world as an obvious possible boon to various casino operators… but now we’re getting the promise that these favored stocks will surge higher on a single day, the Monday after the Super Bowl, and that E.B. Tucker has identified the best bets. “… in the space of 24 hours, the three obscure companies I’m talking about could collect the lion’s share of over $4.7 billion added to their bottom line…. “It’s hard to tell if the NFL is past the point of no return in America… The signs are starting to show a permanent decline. “But the league has one set of hard-core fans who are only growing in number: gamblers. “But thanks to the new Supreme Court ruling, all that is about to change. “The unofficial end of America’s third prohibition… and the first time since 1992 that folks can legally bet on the big game in places other than Vegas…. “It’s hard to know for sure how big the sports betting market will become. But research from the University of Nevada, Las Vegas, suggests that the illegal sports betting industry is turning over $150 billion a year. That’s more than the GDP of Nebraska. “My own research shows that the market should turn out to be even larger than that. Markets the government has outlawed always get bigger when they become legal again…. “Investors may assume that the biggest beneficiaries of sports betting will be the Las Vegas casinos. That couldn’t be more wrong. “Sports betting has been legal in Nevada for years. Last year, the state earned about $250 million from sports betting. So even with this new Supreme Court decision, it’s business as usual for Las Vegas. The ruling won’t hurt. But it won’t cause the casinos there to see a spike in betting…. “The place to start your investment research is with legal casinos in states that previously outlawed sports betting. “Depending on local laws, these can already have a variety of card games and slot machines. 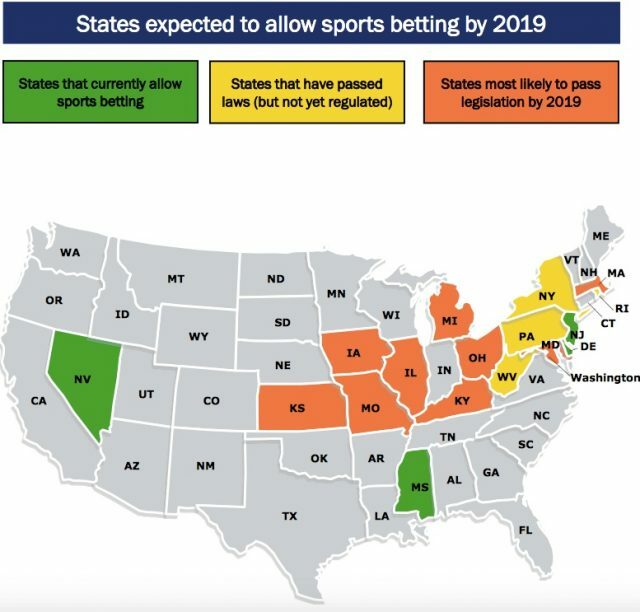 But if they’re in a state that had previously outlawed sports betting, they’re now looking at a new source of revenue…. We should keep in mind that “amount wagered” is not really like “revenue” — the casino or bookmaker ends up keeping a fairly small percentage of each bet, since much of the money just flows from losers to winners. It varies by location, but the casino’s share is generally in the 5-10% range, so that’s really the “revenue” number that matters when it comes to supporting the costs of the operation and eventually generating a profit. “Stock recommendation #1: This legendary company already boasts an iconic asset that alone could double its value. They have a strong presence in eight states and host America’s longest continuously held sports event. But, I believe it’s their technology backbone that will give this company a unique edge when it comes to sports betting. “That’s the TwinSpires business of racetrack owner Churchill Downs (CHDN), which has been talked up as a beneficiary of sports gambling expansion — which makes some sense, since horse wagering is obviously a core part of the history of US sports gambling. They’ve been expanding into other casino operations recently, including buying a couple smaller casinos in Pennsylvania. I’ve not studied it very closely, but compared to some flashier casino stocks Churchill Downs is downright cheap, trading at about 22X next year’s earnings — and while the continued success of the Kentucky Derby will obviously be important to the company, that online wagering company TwinSpires will probably be more imoprtant in the future… and they’ve already launched sports gambling at a couple of their casinos in Mississippi, and are likely to be officially launched in Pennsylvania and New Jersey as soon as the rules are in place. The stock is still about where it was in late August, though it was a bumpy ride for a while — the shares collapsed in October, but then they reported a strong quarter on Halloween and announced an agreement to buy a controlling stake in the owner of the Des Plaines casino in suburban Chicago, presumably in part to give them the “on the ground” presence that will give them a head start and regulatory advantage once Illinois legalizes sports gambling. That seems inevitable, given Illinois’ perpetual budget crisis, though it’s also possible that Illinois will vastly expand legal gambling and therefore bring some possibly dangerous competition for the Des Plaines “Riverboat” casino (Illinois was an early riverboat gambling legalizer, though they are less committed to the “temporary” nature of those riverboats and seem to have treated that notion as a technicality to bypass — from what I can tell, Des Plaines is a permanent structure, built on top of a manmade puddle). So Churchill Downs is still like a lot of other gambling stocks — poised for big gains from further legalization of sports betting in the US… but also suffering from either flat or declining sales in their core businesses as gambling competition heats up around the country and/or tastes change (particularly, in their case, with the declining interest in horse racing… though they are also the chosen operator for a brand new horse track that is planned for Kentucky, so it’s apparently not declining everywhere). “Stock recommendation #2: This company is already a heavyweight in the sports betting arena. Now, thanks to a recent merger, it’s in a unique position to scoop up much of the legal U.S. sports betting market. Simply put, this blockbuster deal creates the largest online sports destination in the entire United States… with a combined presence across 45 states. What’s more, they already have a large, highly-engaged, sports-focused customer base they can immediately tap into. That’s Paddy Power Betfair (PPB.L in London, PDYPY for the US ADR), the venerable UK betting firm which recently acquired the pioneering fantasy sports company FanDuel and is making headway in the US market after building and/or buying large retail betting operations in the UK, Ireland and Australia. Paddy Power was one that stood out for me as interesting when I covered sports betting back in August, though I didn’t buy that stock (or any others in the business) at the time — and it is still at roughly the same price, with pretty steady business that will depend as much on Paddy Power restarting growth at home as it will on catching fire in the US… right now, the US business is only a tiny sliver of the company (7% of revenues, 3% of profits), so it’s going to take a lot of growth for that to be the real driver, and competition and startup spending will probably be pretty dramatic over the next few years as legalization spreads, so even the eventual winners might have numbers that don’t look so great at first. On the plus side, having a big operation and infrastructure and a strong global platform for odds-making and risk management could give both Paddy Power and their competitor William Hill (WMH.L WIMHY), which is similarly expanding in the US (and was touted by McCall in August), a meaningful edge over smaller casinos and startups over the long run. “Stock recommendation #3: Our third stock has seen share prices rise 4x over roughly the past two years. And I believe legal sports betting will only accelerate their growth. They currently operate 26 properties in 13 states. And a whopping 85% of their properties reside in the states making an early move to legalize sports betting. This one, sez the Thinkolator, must be Eldorado Resorts (ERI) — the numbers are slightly off, they actually operate 28 properties in 13 states, according to their website, but they are the midsize casino company with the broadest reach in the US, at least in terms of number of properties and number of different states. They started out with a single casino in Reno, and that was their foundation for almost 40 years, but they have been extremely acquisitive over the past five years, buying or merging with several different regional casino companies to add Circus Circus, Tropicana, Isle of Capri and a few other brands and properties to the collection. Which does provide some advantage for sports gambling, one assumes, because the working guess is that most states are going to require that sports gambling operations, even if they’re primarily online, be controlled by companies who have a physical presence in the state and, perhaps, a history of licensed casino operations. Thats presumably why they made a deal with The Stars Group (TSG)… which, yes, was another stock pitched by McCall back in August (Eldorado already had a deal for sports book operations with William Hill, who will operate their physical casino sports books). Eldorado has shown some pretty phenomenal growth over the past year or two, though that’s mostly “inorganic” growth — meaning they bought new casinos to up their revenue, they didn’t improve the performance of their existing properties that dramatically. Those acquisitions have increased the share count pretty dramatically over the past couple years, as well as the debt burden, but the overall result is still pretty impressive… at least so far. I don’t know anything about their properties or the real operating performance, but the financials look good: They’re expected to have about $1.70 in earnings per share this year, almost doubling to $3.39 next year, and that gives them a forward PE of about 12… pretty cheap, even less expensive than Boyd Gaming (BYD), which is arguably the closest comparison when it comes to regional casino operators (and is also growing like crazy, and hoping to capitalize on their multi-state operations to grow a big sports book). On the other hand, casino investors sometimes think about tentpole casinos or high value properties, and most of Eldorado’s (and Boyd’s) casinos are fairly small and very local, so you’d probably have to know a lot about the specific properties to judge how they might do when competition heats up in their area, or if the local economy takes a downturn. These aren’t landmark casinos like the major properties in Las Vegas and Macau that draw in millions of visitors each year, so it might be hard to have as much faith in the perpetual value of the Tropicana in Evansville, Indiana or the Lady Luck in Black Hawk, Colorado. So where does that leave us? Well, I don’t own any of the stocks, and that isn’t likely to change in the next few weeks… but these are all mainstream gambling companies with meaningful exposure to the expected explosion of US sports gambling. They are also facing the risk of continued stagnant sales or declining growth in some of their core gaming or related businesses, too, which keeps them from being “upside only” investments or providing a lot of certainty about the overall growth trajectory. I wouldn’t bet against gambling in general, though I think the steady expansion of legal gaming across the US is definitely bringing competition and just “having legal gambling” isn’t necessarily going to be enough anymore, whether you’re talking about a sports gambling app or a casino where you can spend a couple hours at the slot machine or the blackjack table — we seem likely headed for a world in which you will probably have to have a better app, a better experience, or a nicer casino to draw growing crowds, which probably means margins will be pressured. So I’m not rushing out to buy any of these, but they strike me as decent ideas and they do have some potential juice from the “story” of expanded legalized sports gambling… as to whether or not these stocks will double in a single day on February 4, or even in the two months between now and February 4, well, I’ll happily take the “under” on that bet. They should get some boost from sports gambling, even if their other businesses are fairly tepid, but there’s no reason for them to see that kind of stock price surge in short order unless we get a silly bubble in sports gambling stocks… which is possible, of course, but not the kind of thing you’d necessarily want to, well, bet on. It’s your money at stake, though, so it’s your opinion that counts… think Eldorado, Paddy Power or Churchill Downs will be big winners from expanded legalized sports gambling in the US over the next couple years? Favor other competitors? Let us know with a comment below. 34 Comments on "Will Feb. 4 be “The Greatest Day in Stock Market History” as Sports Gambling Explodes?" Plus, don’t forget Buffalo Wild Wings is thinking about having their restaurants carry a sports book. That’s 1238 local casinos. That would be impressive… wonder what the regulatory hurdles would be for that! Yeah, but I thought Arbys was owned by Wendys? Wendy’s sold Arbys 7 years ago. They may still own a stock position. They sold out to Inspire (which itself is owned by Roark, a private equity firm) a couple months ago… the same company also bought Sonic, they seem to have taken the mantle from Restaurant Brands this year and become the leaders in “buying up very richly-priced restaurant chains.” Wouldn’t be surprised if they try to load it up with more debt and go crazy building franchise locations and then take the whole magilla public again in a couple years once it looks appealing to investors again. I subscribe to Strategic Investor and your picks are spot on. However, Tucker issued a sell on Eldorado on 10/30 as stop-loss was breached due to ERI’s revenue decline in traditional gambling venues. Thanks pbormann, nice to have the update — though Eldorado is still featured as one of the three hinted-at picks in the ads I’m still getting today (it’s not that unusual for copywriters and marketers to keep touting a stock even after the actual editor has recommended a sell, but it is annoying). For all of these companies does a person physically have to go to their location to bet? Are there any companies that a person can bet with on an app on their phone or without physically going to their location? I think the betting will be held back if people have to physically go to a location. Most states are talking about online gambling being allowed, but perhaps only through casinos who already have a physical location in the state and a regulatory relationship with the government. New Jersey already has a half dozen online gambling providers available, Pennsylvania has launched with physical casino sports books but is expected to allow online betting soon, haven’t looked into any other states yet but I bet they’ll mostly be online eventually. Be careful here, rarely, if ever, does a $49./yr. publication make their readers rich! “The expensive letters aren’t any better than the cheap ones” is a refrain I often hear, too, spending $2,000 on a newsletter doesn’t necessarily make the performance dramatically better… as with actual money managers, on average the cost matters more because it’s a negative drag than because it buys you better performance. I frankly dont see what is generating the income….moderate to low dividend here. Where are the gains published coming from here…. Travis…why did you NOT mention Indian casinos?? Will they NOT be allowed sports betting?? I wish lawmakers would fix the lottery scam. A billion $ payout to only 1 person?? Really?? A trillion to one chance of winning?? Really?? I enjoy Thinkolator’s analysis, but has anyone ever considered that these Pundits like McCall, Casey, et al., deliberately plant false clues so Thinkolator can’t figure out the correct stocks? I mean, their whole pitch is geared to get people to sign up for their newsletters, blogs, etc., so why would they give out genuine clues? They do, sometimes… but they generally shy away from actually lying most of the time, that doesn’t tend to sit well with customers even if it’s not about something material. 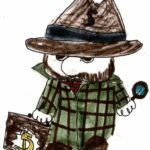 Real tidbits of information make the idea more tantalizing, which drives more buyers… sadly, not everyone comes over here to Stock Gumshoe to check the details first, so we probably don’t have all that much influence on their campaigns. Thanks for the reply. I guess what you say makes sense. I know I’ve come here several times to avoid getting ripped off. The old “if it seems too good to be true, it IS too good to be true” principle works pretty well too. Casey also recommends Penn National Gaming and William Hill. Well, that covers almost everybody you’d include in a “sports gambling” ETF! If the event happens the 4th won’t the stock rise long before that? Buy the rumor sell the news? There’s no predictable real event where these stocks will instantly become more beloved overnight… that’s just a false deadline to encourage subscriptions, almost everything is more nuanced and evolutionary than the newsletter pitchmen would like you to believe. In the latest video (for the same product), EB mentioned that the 4th was significant because it is the day after the Superbowl, which has the most betting of any single event (if I recall the info from the video correctly). I would imagine buying the the software platform company that provides the online gaming/betting software algorithms would give exposure to most of these online gaming companies? Who makes the software? I don’t know that there is a leading provider of software. Most of the big companies run their own sports books systems, which seems to me to give them an advantage in setting odds with more outlets and bettors — even Churchill Downs highlights their online wagering capability with twinspires.com. Is BJK likely to appreciate as a result of this development? John, interesting thought that made me wonder about their options. I just looked at the options for it and it is just too thinly traded for me. I’m being inundated with emails from Casey research. I’m just starting to figure out which so called investor helpers I can delete and unsubscribe from but it’s taken me a few weeks to figure it out as I’m so new to trading. Casey is one of them. While 4 Feb is not that long ago it is interesting, given the promotional pitch, to see what some of these stocks did and are doing: PDYPY 4 Feb $42.42 and down from there. WIMHY 4 Feb $9.66 and up to $10.08 and then down. CHDN 4 Feb $92.55 then up to $97.65 and down to $92 and change. Over time maybe these could pop but for now the only ones appearing to make money are the newsletter pitchmen.